I think it is kind of funny in a way I had set up unix.superglobalmegacorp.com years ago, but moved hosts a few times, and it broke all the CGI functionality. But all the static pages still worked, so when googling around for internal stuff related to Quake, I would actually find my old site in the top five. So, I thought I’d take some time, and get it working again. I use two programs CVSweb, and src2html. 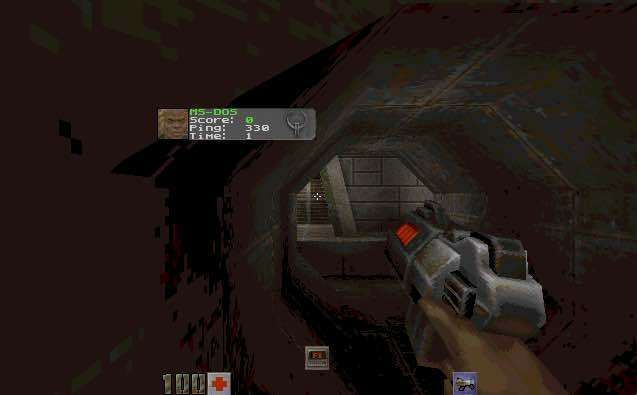 Quake, the popular game from iD. Quake II, the successor to Quake. So it may not be worth much to most users, but when looking to see how various code works, it’s really useful. 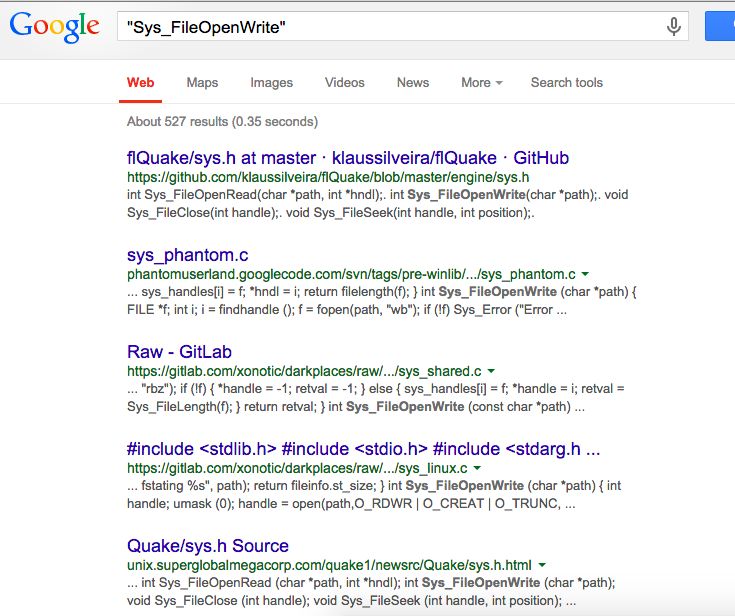 Of course none of this compares to Visual Studio’s search database, but google has to learn from somewhere. I should also point out that upgrading perl as part of a move from Debian 7 to Debian 8 broke CVS web. Thankfully the NetBSD folk had a simple 2 line fix! Bringing it all home for release day. Since the last update we got some help in a few fields that have really fleshed out this ‘experimental’ port into a full fledged port. First RayerR helped us with the fun of getting us onto the latest deployment of DJGPP, 2.05 (rc1). It’s always nice to be in the latest available release. Next in a passing comment, Ruslan Starodubov had mentioned that he had gotten a much older build of our QDOS to support the Intel HDA sound chipset via the MPXPlay sound library. I wrote to the author of MPXPlay, Pádár Attila asking for us to distribute his source in our project, and he granted permission. So at this point things were looking good. The only ‘feature’ that modern OS’s really held over us was the ability to dynamically load and unload game modules on the fly. I had tried to use DLM, but it stripped the DPMI functionality out of the MS-DOS Extender making the port really useless. I tried to build the newer DXE3 support but had no luck. I suspect now my native tool chain was interfering with the build process. But Maraakate managed to get it to not only build, but to run! Adding in DX3 support was relatively painless. I first looked at DJGPP’s FAQ and downloaded the example code. In the example code there was small helper functions to make unions and check the symbols. If they didn’t exist a printf was spit out to alert you about it. To resolve the issue you simply just add DXE_EXPORT to the other list of missing exports. Compiling the game code was easy, again referring to the example I saw that basically they compiled it the same, but at link time you use DX3GEN and -U flag to ignore unresolved symbols.  The biggest head scratcher was the Sys_GetGameAPI failing to find GetGameAPI from the DX3. After some piddling around I noticed that it listed GetGameAPI as _GetGameAPI inside the DX3 itself. I added the underscore and it worked! Other things that were relatively to easy to import was R1Q2’s HTTP downloading code. Compiling CURL was kind of tricky because of the linking order, but thankfully neozeed figured it out quickly. All of Yamagi’s Quake 2 updated game DLLs were all diff’d by hand using BeyondCompare to make sure I didn’t clash using some newer functions that weren’t available in DJGPP. I also merged their Zaero code with their baseq2 code by comparing Zaeros code to the Quake 2 SDK, marking every thing that was changed. The result is a really stable Zaero game code. If you haven’t played Zaero check it out. I think it’s a lot better than Rogue, but Xatrix is probably my favourite (even over stock Q2). Other cool things I’m glad to get into the code was the GameSpy Browser. It took me quite a bit of work to get it where it is, but it’s really nice to just be able to ping to a master server (a custom GameSpy emulator I wrote specifically for Q2DOS. Source is not finalized yet, but will be available soon for those curious), pick a server and go! All in DOS! So here we are at the end of the journey. Or at least safe enough for a 1.0 release. * Loading/unloading game DLLs in DX3 format. And I should add, that it works GREAT on my MSI Z87 motherboard. 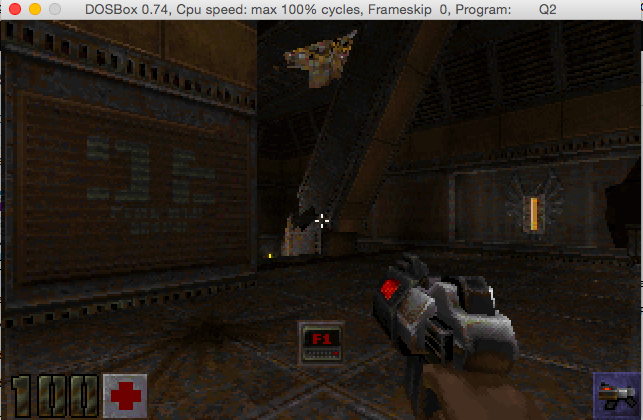 You can download Quake II for MS-DOS on bitbucket. And as always the source is available here. Don’t forget you can always make bootable USB stick with DOS, or CD-ROMs. PCem does the IBM PS/1 2011! But it doesn’t work. Well for me. But rest assured that the other drivers work, and even better it feels that the dynamic support has gotten faster, and some faster Pentium models have even been thrown into the deal! Download my latest build here. Author neozeedPosted on June 24, 2015 Categories pcem47 Comments on PCem does the IBM PS/1 2011! No I’m not dead, just been busy. Infer: static code analysis from facebook of all people. Supports C, Objective-C and Java. Dr Jack Whitham’s blog, with some interesting stuff related to compiler optimizations and how they alter floating point results, along with ‘bug 323‘, and some DOOM fun! Plus he has his updated source repositories online here. And finally, Building A 10BASE5 “Thick ethernet” network. A fun look at the first gen ethernet cabling on ‘slightly’ newer machines. Well it mostly works now. But did we ever have the biggest fun with the sound and SVGA. 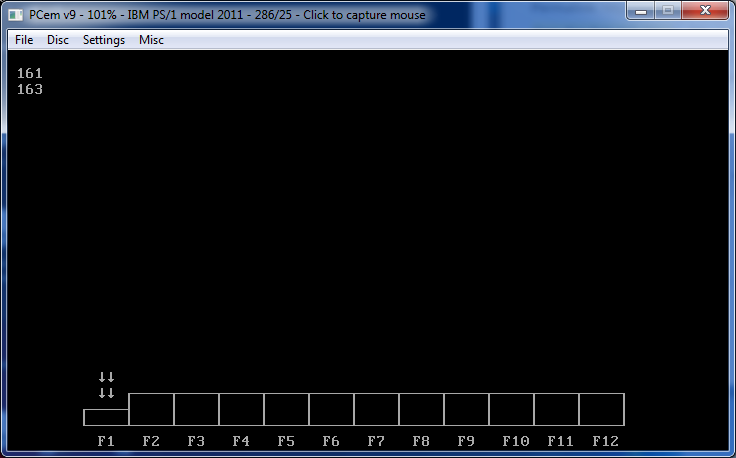 So [HCI]Mara’akate integrated all the Q1 sound code, got it to compile, but nothing not a peep from the sound card. While I was busy trashing the video code, he spent way too much time on the audio, and then for the heck of it I thought I’d look at the code, although I’m really stabbing in the dark when it comes to audio. Imagine my surprise when I compiled the code, and ran it and got the sound blasting at full volume! It turns out that I had my audio set to ‘high quality’ in the client, while he had his set to ‘low quality’. What it does is govern the frequency between 11Khz and 22Khz. And if you get this wrong you get *NO* audio. OOPS. At least it was one of those feeling vindicated moments that his efforts for sound really did work. Now with audio, it was my time to hurry up and get the video going. I had basic VGA working so I figured I didn’t want to spend a lot of time on this, so I was going to go with the VESA 2.0 linear frame buffer. Well this once more again proved to be a bit more involved as the only way I really have to test is emulation via DOSBox and Qemu. And naturally both of them worked fine, but when [HCI]Mara’akate ran it on his real DOS Box (with GUS of course) it crashed wonderfully. Now I had taken the VESA init code from Quake 1 to build a table of what 8bit modes are supported, and used the VESA code to switch, along with drawing to the buffer with a simple memcpy. And we got nothing but crashes. After looking more around, I found that you had to add 0x4000 to the VESA mode you want if you wanted to access it’s LFB. Did that work? No still crashed. WRONG. Oh so WRONG. Well OK technically it did work, but if sound is enabled (and why wouldn’t it be?) it would immediately crash with an error in the DMA code. We ended up wasting over a day trying to figure this one out until I just said screw it, let’s never dsiable the nearpointer, leave it unprotected. Naturally that actually worked. The hint is in map_in_conventional_memory, where __djgpp_nearptr_enable(); is called, but of course there is no calls to __djgpp_nearptr_disable(); I’ve thought about going back through the source to ‘clean’ it up to make it lock and unlock memory as needed, but this is 2015 not 1997 so good enough is well, good enough. So now with VESA and Sound, I thought this would be a great time to tackle the dynamic loading of gamex86. We will have to re-compile whatever gamex86 DLLs are out there as of course DOS is DOS. The HX DOS guy Japheth seems to have died, as his site and all the info on that extender seems to have mostly vanished. I have an old copy, but I never could make it call DOS stuff if you had WIN32 stuff going on. And if he’s really dead it’s too late to ask him. Ages ago I remembered this DLL support for DJGPP called DLM, so I thought I’d give that a try. 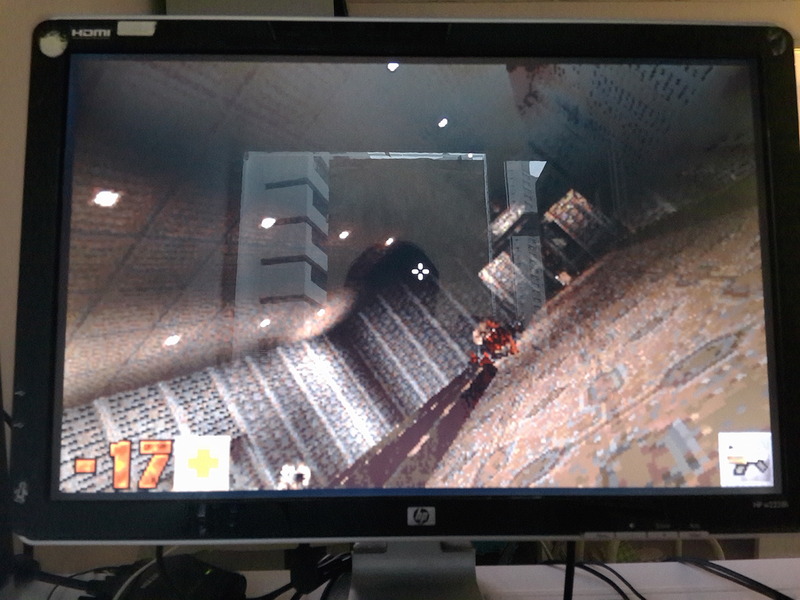 I was able to take our ‘null’ version of Quake II, and get it to where it can load and unload the gamex86.dlm at will. So I figured this was going to be an easy win, right? So apparently it doesn’t export (or import) djgpp stuff like the base address calculations so we can’t do direct memory access, which means no video and no sound. Ouch. I’ll have to hit the lists to see about support. I don’t like the DXE’s because they cannot be unloaded, so that isn’t much good. And of course things like the JVM inside of gamex86.dll is right out as JAVA inside of MS-DOS? in 64MB of RAM? Dream on. So for now, the gamex86.dll is statically linked into the executable. You are restricted to vanilla gameplay for now. As an added bonus, I used Rufus 2.2, to setup a bootable MS-DOS USB stick, slapped everything onto there, and booted up on my Xeon, and it works! Now as a super bonus, [HCI]Mara’akate went above and beyond by adding in a bunch of fixes, and updates from 3.24 and varous stuff from Knightmare. And then the best part is integrating libogg, so it can now play the ogg sound track! Really, just place the ogg files in the baseq2\music directory and away you go! For those who care the bitbucket of the project is here, and binaries are here. For anyone who is interested, I’ve updated the binaries, to include the latest version with built in quakespy technology! Run an /slist2 and get a list of servers! For the more adventurous trying to build from source, we are using GCC 2.95.3 and DJGPP 2.04. All of the sub libraries that you need to build are already pre-compiled in source drop. Installing the packet driver will require a driver from the crynwr project. You can find a description of some of the drivers here. Sadly for new cards I think we are left in the dark. Continued in pt4, and part 5. 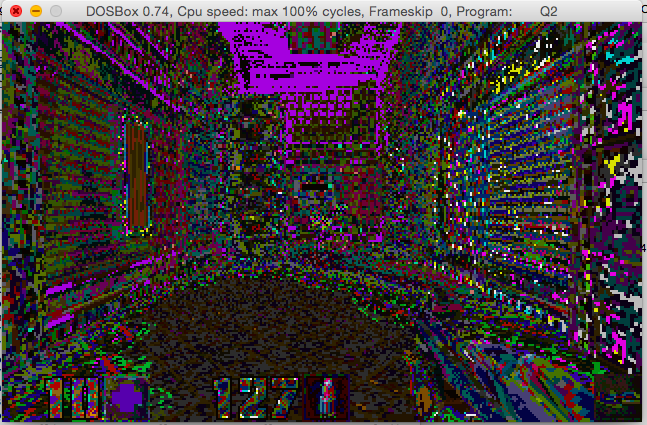 Continuing in this series on porting Quake II to MS-DOS, we get to touch some of the fun stuff. The first big ‘fun’ thing is networking. Now in my prior work with the MS-DOS version of Quake, I had used the WATTCP library to bring networking to the otherwise Windows/UNIX specific fun of network deathmatch back to MS-DOS. Quake by default had support for the Beame & Whiteside’s TCP/IP stack which for all intents and purposes has vanished from the face of the Earth (does anyone have a copy?!). So at the time, I thought it’d be cool to try to interface WATTCP with Quake, and it worked on the first attempt as WATTCP is a very competent TCP/IP stack. So I took the Linux networking file net_udp, and compiled it, and I got an executable! 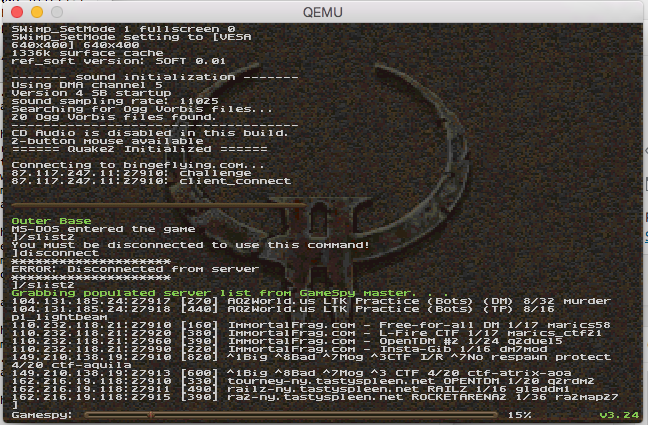 When it comes to testing WATTCP though, I prefer to use Qemu instead of DOSBox as it can not only emulate various network cards to which I can find packet drivers (yes even the evil PCI NE2000!) but it has a built in SLiRP network stack that let’s me NAT on my desktop without any crazy network configs. And for the sake of testing, I setup a ‘null’ text mode server, figured out some flags, and I was able to connect! 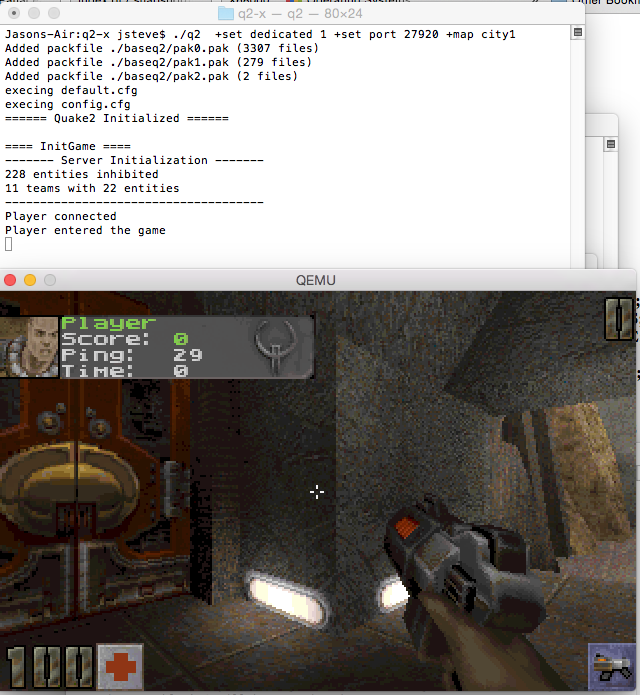 Quake II for MS-DOS running on Qemu connected to a dedicated OS X server. Now for some interesting stuff. First I noticed that MS-DOS 5.00 with himem.sys is almost unplayable because it is so slow. MS-DOS 4.01 without himem.sys is actually faster. No, I’m not kidding. Next is that some levels LOVE to gobble up RAM. Maps like city1 will need at least 192MB of ram. I haven’t even tried playing with the virtual memory of DJGPP, and I really don’t want to. 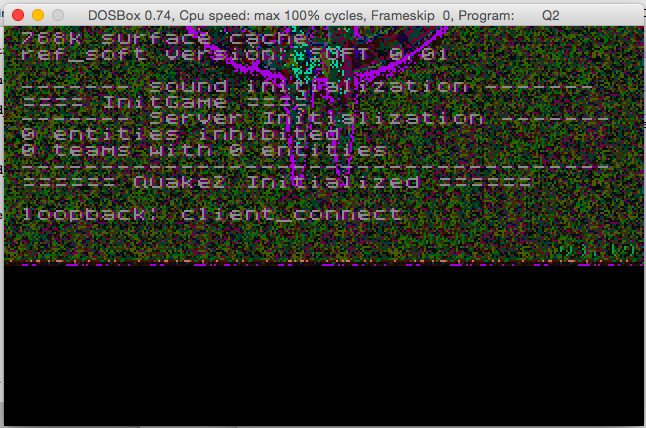 And let’s face if, if you even try to load Quake II on a MS-DOS machine, it better be a ‘big’ one. This means you should be using the ‘dos’ from Windows 98, or perhaps FreeDOS, although I haven’t tested that at all. So far from our limited testing the networking seems to be pretty good. And at least that is one function we didn’t have to really pour a lot of effort into. Although the payoff of being able to connect to servers on the LAN and even the internet is a good thing. Continued in pt3, pt4, and part 5.